I am planning to live until I am at least 125 years old. I’m not looking to set a new world record, I just have a very long to do list. Here on earth I plan to climb Mt. Ranier, eat street food in Thailand, successfully grow a garden, write a cookbook, live in Mexico, and…well…you get the point; it’s a long list. This week I crossed off #89 on my life list: make a cheesecake. I realize that this little accomplishment pales in comparison to #176 which is to visit all 50 states by motorcycle or #211 which is to learn to speak fluent Arabic, but I’m practicing baby steps here. After all, I’ve got a good 90 plus years of living left. I am a little disappointed that it took me this long to cross cheesecake off my list. Had I known how easy it was to make or how delicious a homemade version could be, I would have crossed it off my list years ago. Unfortunately, horror stories of large fissures tearing through the middle of an over-baked cheesecake resulted in some serious procrastination when it came to making it at home. What a shame! A classic cheesecake requires very few ingredients and is surprisingly simple to make. Over-baking the cake will lead to cracks, but the recipe that I followed calls for spreading the top of the cake with sour cream near the end of baking. It’s a neat trick that should ease any fears of over-baking as the sour cream covers up any cracks giving you a picture-perfect cake. Like a good black dress, this cheesecake stands well on its own, but I couldn’t resist adding some fresh strawberries tossed with a little sugar over the top. While it is still early, strawberry season is almost here and I’ve purchased a couple of pints that have been worth every penny. Blueberries, blackberries, or a warm chocolate sauce would make excellent substitutes for the strawberries if you were so inclined. Regardless of what topping you choose, don’t wait to make this cheesecake. If your to-do list looks anything like mine, you’ll find that making this cake is a tasty chore to cross off. Preheat the oven to 350 degrees and place a rack in the center of it. Grease a springform pan with a little butter. In a small bowl, mix all the ingredients for the crust together until well combined. 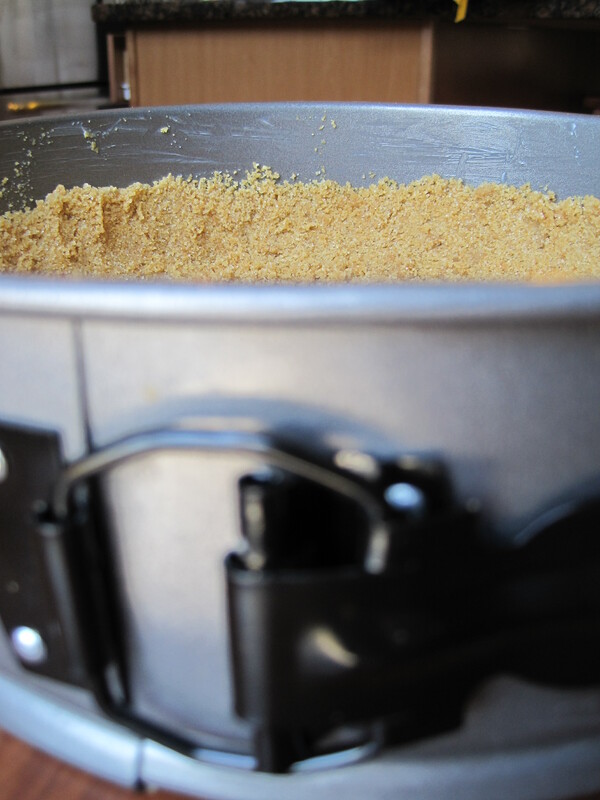 Use your fingers to press the crust on the bottom and 1-inch up the sides of the greased pan. Set aside. Beat the cream cheese on high-speed until light and fluffy with an electric mixer. Reduce the heat to medium-low and add in the eggs, one at a time. Add in the 1 cup of sugar and 1 1/2 teaspoons of vanilla extract. Beat on low-speed until combined. 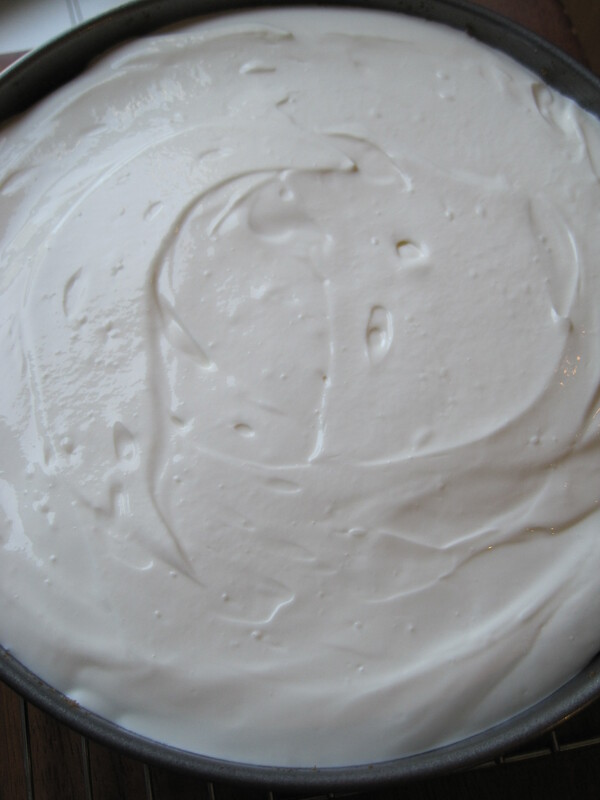 Be sure to scrape the sides of the bowl as you beat the mixture to prevent having cream cheese lumps in the batter. 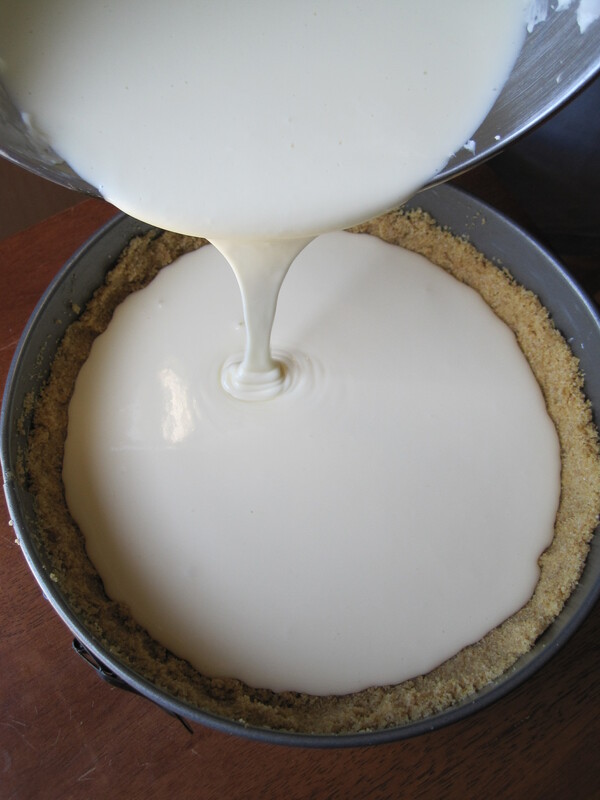 Pour the cream cheese filling into the crust and place the springform pan on a baking sheet (to catch any leaks during baking). Place the cake on the center rack in the oven and bake for 50 minutes or until the sides have set, but the center still moves slightly. 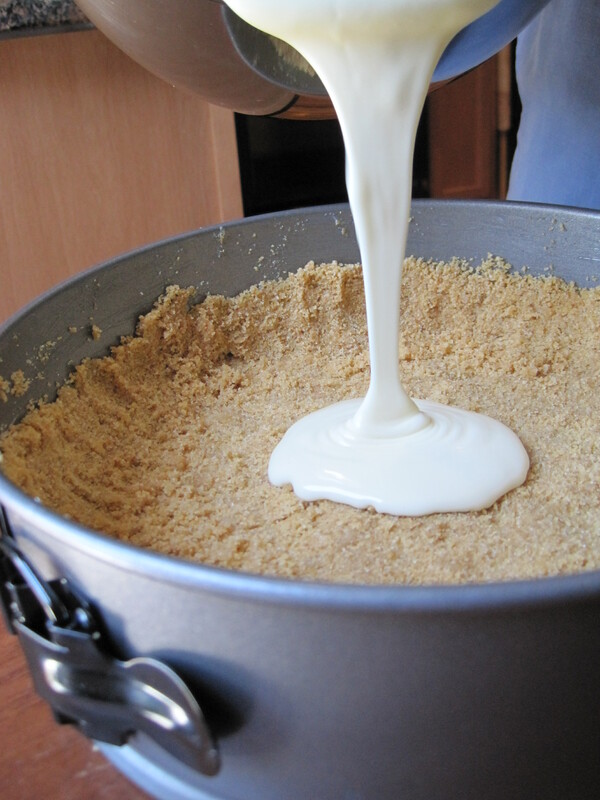 Meanwhile, combine the sour cream, the remaining tablespoon of sugar, and 1 teaspoon vanilla in a small bowl. Remove the cake from the oven and let cool for five minutes. 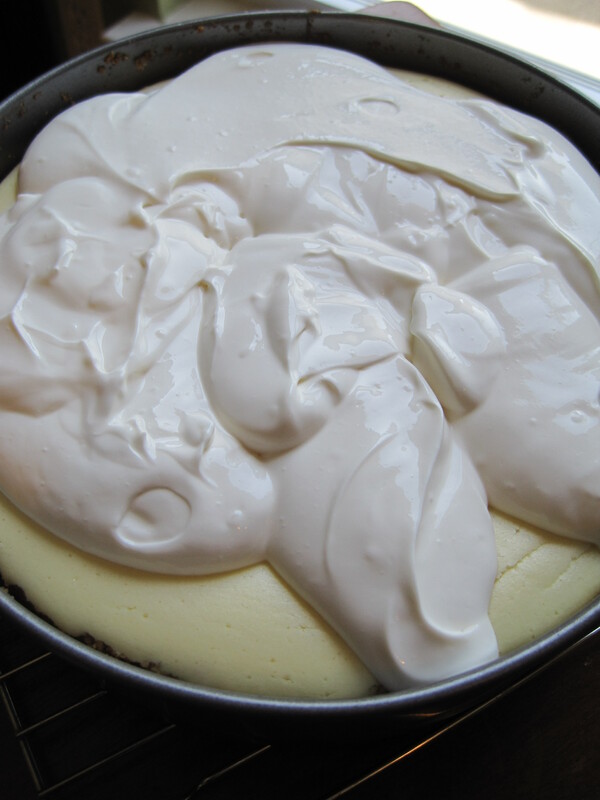 Spoon the sour cream mixture over the top of the cheesecake and spread it evenly over the cake. Return the cake to the oven for another ten minutes. Remove the cake from the oven and place it on a wire rack. Run a knife around the edges of the pan to loosen the cake and prevent it from cracking as it cools. Allow the cake to cool completely on the wire rack before moving it to the refrigerator. Let the cake chill for at least 5 hours, preferably longer, before serving. 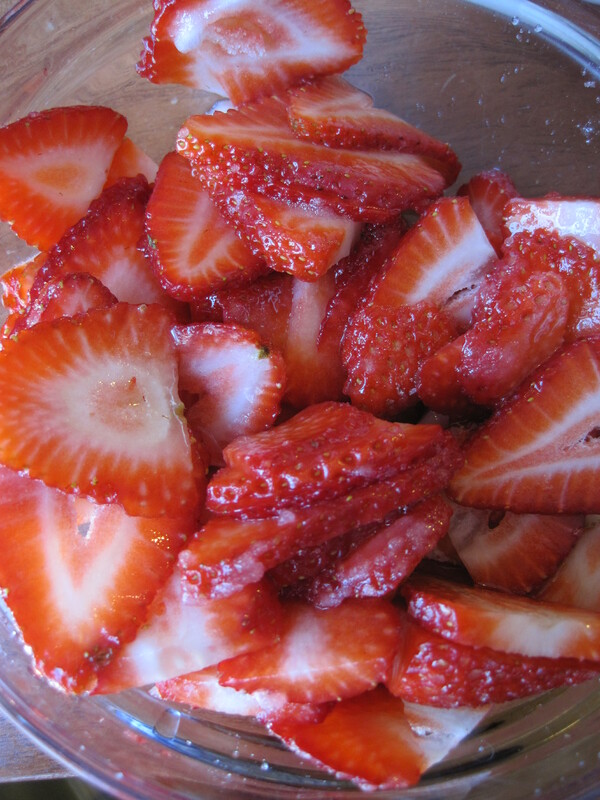 Combine the strawberry slices and the sugar in a small bowl prior to serving. 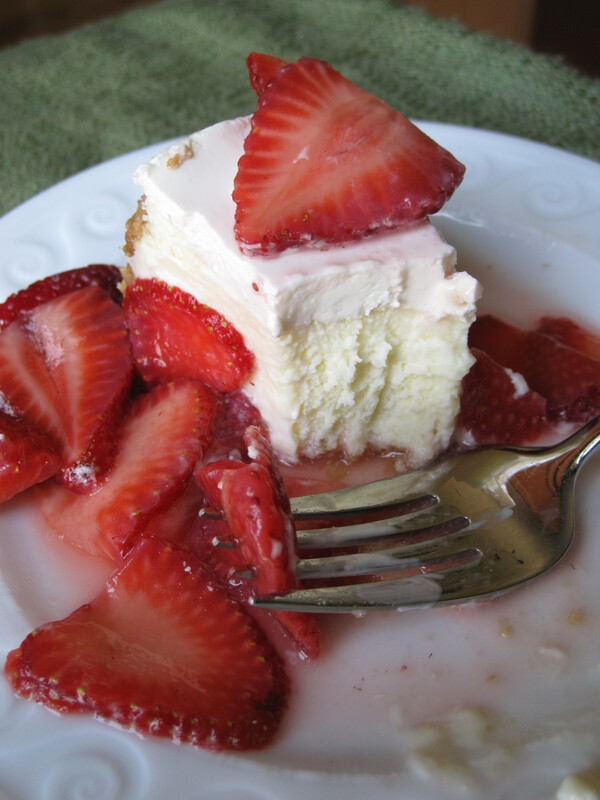 When ready to serve, spoon the strawberries over a slice of cheesecake. Enjoy! 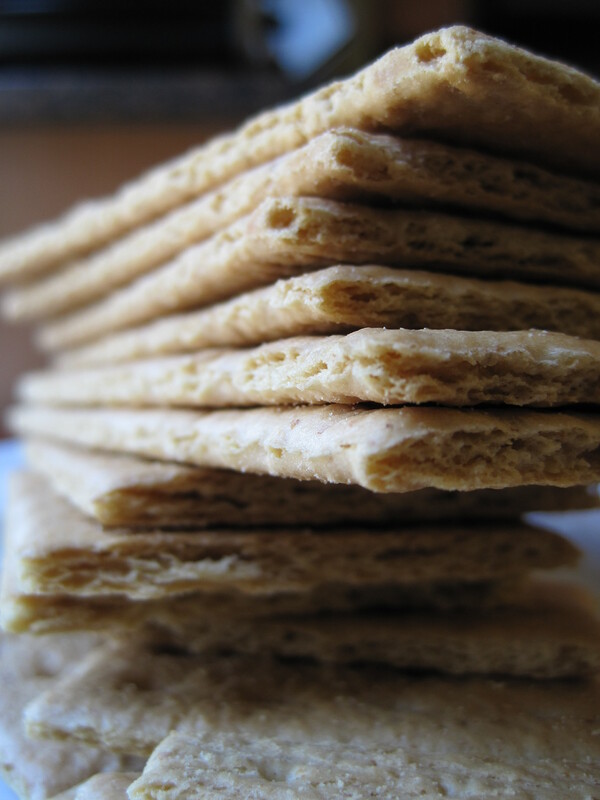 I love the idea of making it with vanilla wafers. I actually picked some up at the store when I was buying the graham crackers…. I guess I’ll just have to make another one as well! What a gorgeous cheesecake. I’ll have to put it on my list (and then cross it off). Yes! I know it sounds like a lot, but you’ll be happy when you take a bite.